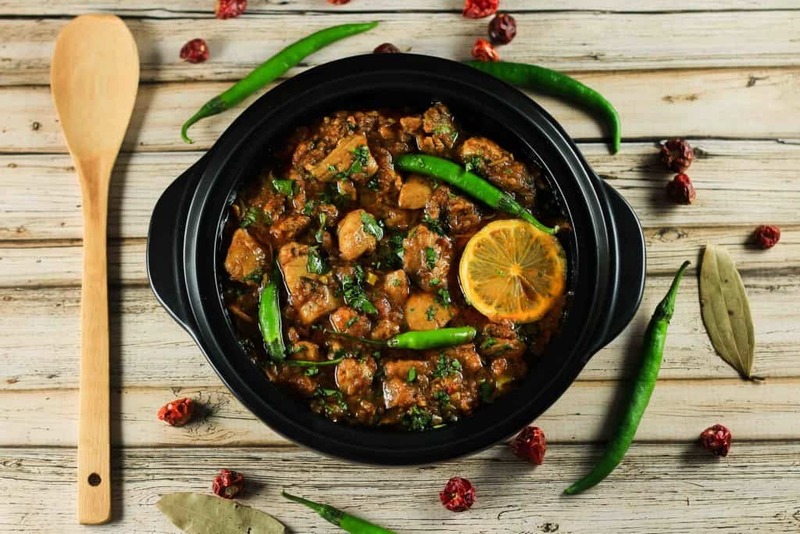 You’ll definitely end up impressing your friends and family with this delicious authentic Chicken Karahi Curry recipe! It’s so simple to make and tastes completely authentic! If there is one thing we know for sure, it is that our mixed ethnic background has led us to try so many cuisines lately, but both of us keep rushing back to this amazingly spicy yet tangy Indian/Pakistani Curry called Karahi. 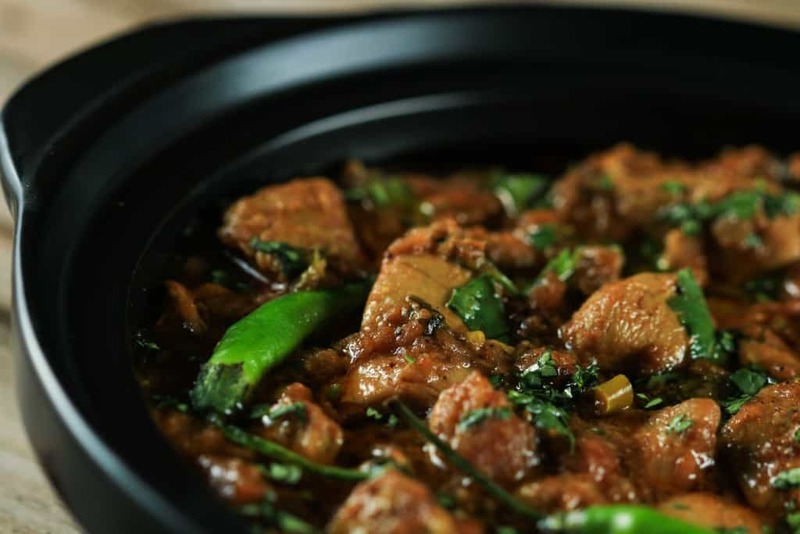 If you haven’t heard of Karahi, don’t worry! This is the basic Indian curry you see in the restaurants (and also the one you crave late at night!). Typically North Indian and Pakistani curries (no really, they’re nearly identical!) have either a tomato base or a yogurt base – and sometimes mixture of both! The aromatic spices and herbs used in this curry makes it extra special. And the best part is that it’s super easy! (We promise to you it is!). In fact, you can be done making the whole curry in 30 mins tops! How’s that for a weekend family dinner dish eh? There are SO many variations of Karahi it’s ridiculous! 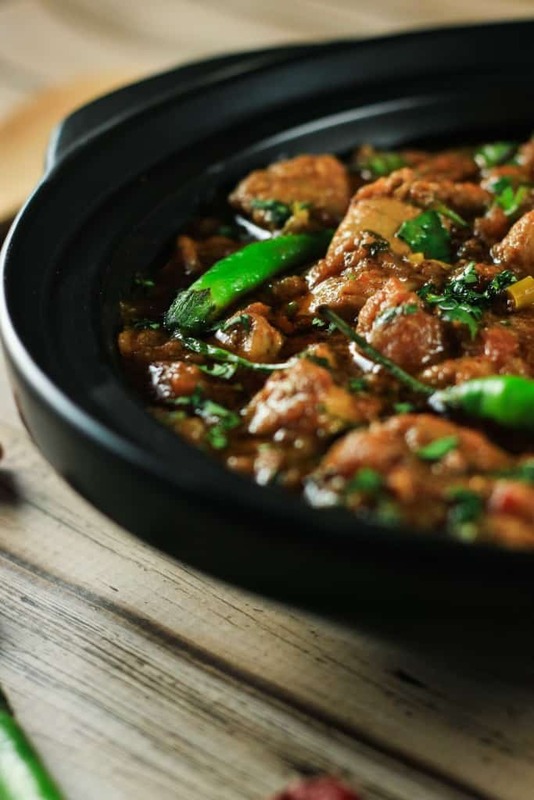 Every region in India and Pakistan will have a certain twist to their Karahi but the basis of it is usually the same. We absolutely love this version because it’s so easy and quick to make but it always seems like you put incredible amounts of effort into it! We’re sure you’ll end up impressing some of your Indian/Pakistani friends when you whip this up at your next dinner party. As most of you would know, both of us are certified chefs (and holistic nutritionists in the making! You can read more about us here) but this particular curry was something we just could not perfect ourselves. While living away from our families in Dubai, both of us resorted to each other’s kitchen to try and replicate this curry that we’ve had so many times at home – but it just wouldn’t taste right. And it didn’t help that we were (read: Aena was) craving it SO bad (we sense some home sickness!). So we resorted to having Aena’s mom demonstrate the curry for us when we met her recently and after some practise, we finally have it down! And trust us, we’re so excited to be sharing it with you. The secret is in the technique – but it really isn’t complicated at all. Just follow the recipe to a tee and you’ll end up making the tastiest curry you’ve ever had! It’s delicious, it’s spicy, it’s everything you wish it would be! Top it off with some coriander before serving to give it a beautiful touch of green (and some seriously amazing aroma!). 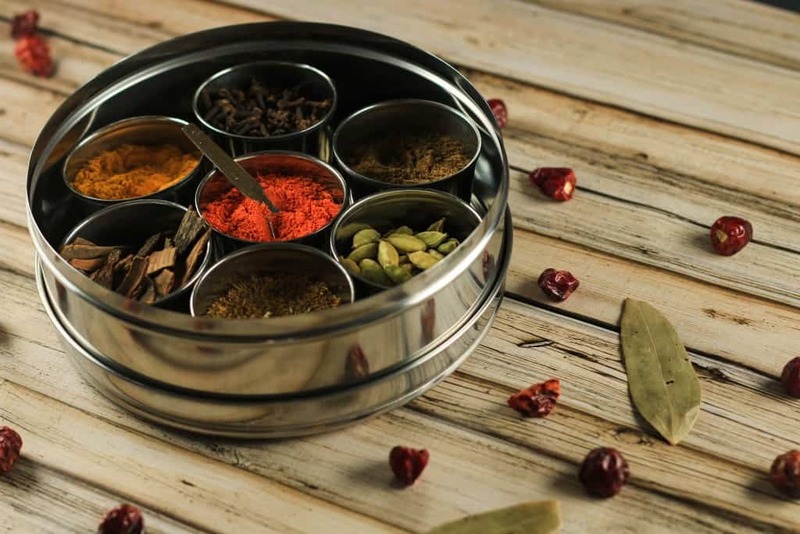 Aena got this beautiful spice box some time back and we just had to include it in the pictures. The colors are beautiful and it’s so convenient to use while looking! We didn’t really need to use all the spices in this box but it sure came handy! Also remember, you can totally make the curry spicier or milder as per your liking. This curry is just right though, and is our absolute favorite! The chicken is tender and juicy while the curry has perfect balance of all the spices. It goes perfectly with bread (naan is our choice!) and makes for a perfect family dinner. So are we all ready for the recipe? Here goes! You'll definitely end up impressing your friends and family with this delicious recipe! Roughly chop the tomatoes without removing the skin and mince garlic and ginger. Heat oil in pan on medium heat. Add the onions and sauté until they start to turn golden. Add ginger and garlic and cook for one minute while constantly stirring. Add the chicken to the pan and sauté (until the chicken has turned white). Add all the spices (red chili powder, garam masala, white cumin and turmeric) and cook for 30 seconds while constantly stirring. Immediately add ½ cup water to the pan to prevent the spices from burning and follow it with the chopped tomatoes. Leave to cook on medium to low heat for approximately 20 to 30 minutes or until the tomatoes have completely dissolved. Add more water and cook for 5 minutes longer if the chicken isn't tender yet. All the spices will infuse into the chicken and by the time it's tender they'll be infused into the chicken - yum! Taste and adjust spices. Add salt to taste. Garnish with green chilis and coriander before serving as well as a dash of lemon juice. You can use garlic and ginger paste instead of minced ginger and garlic. Add a little water and cook for 5 to 10 minutes longer if tomatoes haven't dissolved completely before taking off the stove. All this food talk about this delicious curry made us extremely hungry! But thankfully we have some left over from last night. Make sure to come back to our website tomorrow for a new delicious recipe! I currently have some chicken marinading in a from scratch Tikka concoction, is this recipe for Karahi ok to use that tikkad chicken? Hi guys! Thanks for joining my #MonthlyMasala link party! I love your recipe so much that I’ve decided to feature it in Parade’s Community Table! Thanks again, and hope to see you next month! Hi Whitney! Just saw your comment, thank you SO much! This was the link party we ever took part in and we love it! We’ll be looking out for more from you. And yes, we’ll definitely be coming back next month. Thanks again from both of us! This looks awesome! I can’t wait to try it. Question: Is white cumin powder a lot different than regular cumin? I don’t think I’ve ever seen it. Hi Amanda! Thank you so much. Hope you’ve given it a try by now! White cumin is generally called cumin, so it’s the same thing! The only reason I mentioned white in the recipe was because Indian cooking requires black cumin at times too – so just to make sure no one accidentally adds black cumin instead of white cumin! Let me know if you have any other questions, will be happy to reply! 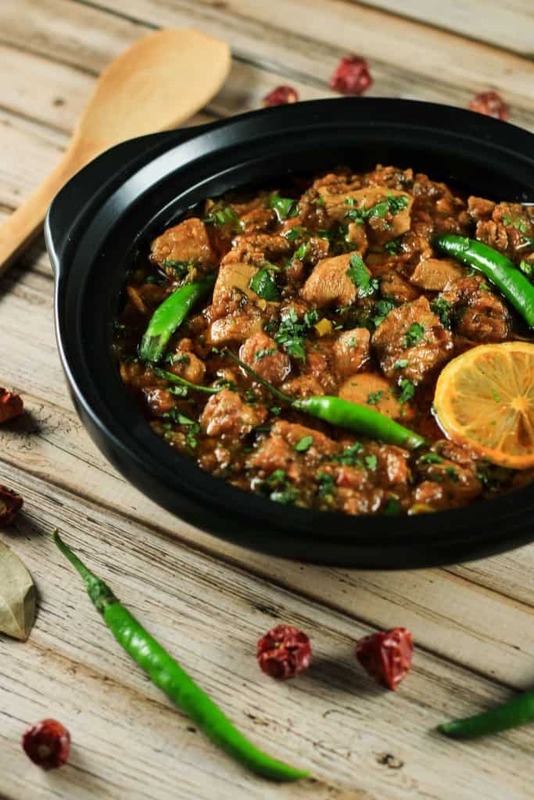 I haven’t ever heard of Karahi; I think most of the restaurants in my area are more from Southern India, so I haven’t had a lot of Pakistani/Northern Indian food. I’ll have to try out this recipe because, from the pictures, it looks delicious! 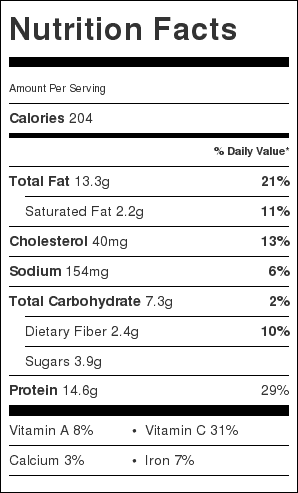 I like that it doesn’t have a million ingredients either. I may try this out this weekend for a family dinner! Hi Drew! You’re absolutely right! It’s definitely a North Indian/Pakistani dish than a South Indian dish, and that’s probably why you haven’t ever heard of it! Karahi is actually one of the most basic curries in North Indian/Pakistani cuisine. It’s the first ‘curry’ that comes to our mind when someone just mentions having eaten an Indian curry! Do try it out and let us know what you think about it! We’ll be posting a delicious Qeema (spicy minced meat) recipe this week too on the blog. 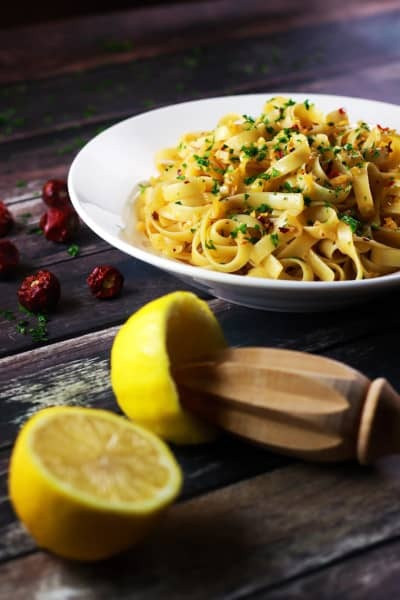 Do try that out too – the ingredients are very similar and it’s just as easy! I bought a chicken masala spice mix from india and was wondering if i could use it for this recipe? If so, what spices can I leave out? Hi Maz! Oh wow, you had a chance to visit India? I hope you had a good time there! Chicken masala spice mix varies from company to company – so some might have all the ingredients while others might not. If you can email a picture of it to me (plus a picture of the ingredients section) to [email protected], I can let you know! But usually, it’s give or take the same thing – so if you want to use that, all you do is follow out instructions to make the recipe but add the chicken masala spice mix instead of the spices we mentioned in step 6. So glad you’re trying it out!! Let us know how it turns out for you 😀 Happy cooking beautiful! After having the recipe for weeks I finally made it and the family fell in love with it! I used 2 serrano peppers (chopped into the dish instead of whole like the picture) for the optional chiles as they were the only chile peppers I had on hand and I also used heaping measurements of all spices. When I first tasted it before serving I thought my sons would not eat it because it was very spicy, but they absolutely loved it! I will make this often. I served it with homemade naan, basmati rice and peas and yogurt with cilantro. The only thing is that my dish came out more yellow/orange than the picture. I made this recipe using a whole chicken. I added three teaspoons of Karahi Shan Masala along with the other spices listed in the recipe, and it turned out soooo extremely delicious. Tomatoes were soft, onions were nicely caramelized, and I served it with Basmati Rice. This is by far the BEST Karahi recipe I have ever made! Thank you!!! I have several Indian friends and I LOVE Indian food. In 2014, I went to India with one of my Indian friends and we were there for 3 weeks (South India and also North in West Bengal). He doesn’t care for hot/spicy Indian food (or any hot/spicy food, for that matter); he is more of a meat and potatoes kind of guy. When we were there in India and we would order dinner, he would order light to very mild spice and I would order hot-spicy food. Even the light to very mild spice was too hot for him and he would end up only eating about ¼ of his meal. I would eat all of mine and finish the ¾ of his that he wouldn’t eat. 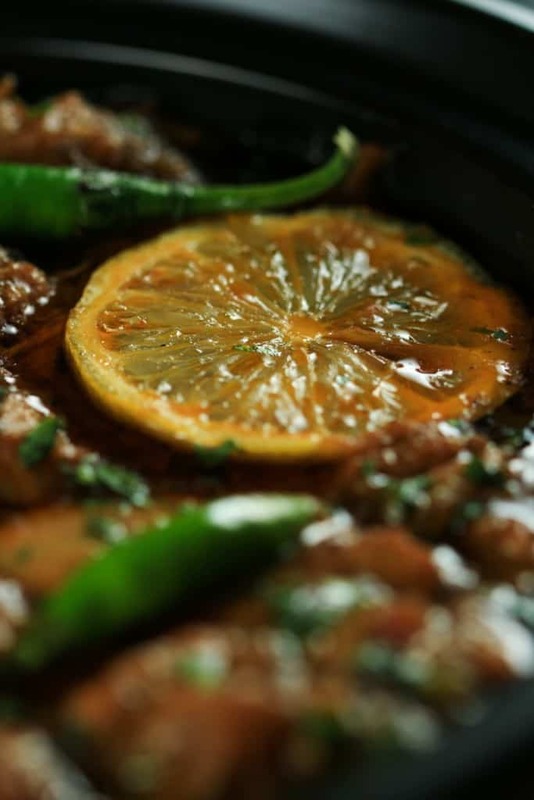 This Karahi recipe looks like it is right up my alley. I am going to try it very soon. Thanks for sharing it. Delicious. Am making it again tonight. I served it with onion and tomato salad, homemade raita and Tescos finest coriander nan. It’s my favourite all time recipe now. Thank you so much.